The tobacco splitworm (ESA accepted common name potato tuber moth) has been a minor pest of tobacco for at least 100 years. Splitworm moths are small (wingspan is about ½-inch), grayish brown, and the back edge of their wings are heavily fringed. Larvae and their damage are far readily visible than the adults. The larvae mine or tunnel between the upper and lower surfaces of tobacco leaves. Female moths lay eggs at the base of tobacco plants, on the soil surface. After the larvae hatch, they move up the stalk and begin feeding on leaves. Damage first appears on lower stalk leaves, but the larvae are capable of feeding on leaves throughout the plant if lower stalk leaves are not present. Newly hatched larvae are roughly 2 mm long, and the galleries they create are also small. Splitworms typically spend their entire larval lifespan in a single gallery, although they may feed internally on leaf veins, making it appear as though they create multiple galleries. In total, a single mature gallery takes up roughly 2 square inches. If you hold a damaged leaf up to the light, you may be able to see the silhouette of the caterpillar moving within the window in the leaf. Tobacco spitworm larvae in their galleries (circled). 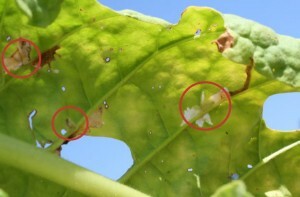 In large infestations, multiple larvae may be present on a single leaf. In some cases, the larvae also tunnel into the stem or into the bud area. When infestations begin early in the growing season (which was the usual case prior to 2002), splitworms may affect all leaves of the plants at once. If infestations begin later, as they have since 2002, they start on the lower leaves and move up the stalk. No threshold for tobacco splitworm has been established, but if 10 percent or more of plants are significantly infested (10 or more mines), control is probably justified because populations of this insect can increase rapidly. If splitworm galleries are found on plants pretopping (likely first generation damage), plants should be careful scouted after topping to detect second and third generation damage and time treatment. Although they can be potentially devastating, tobacco splitworms are an occasional pest of tobacco, and preventative treatment is not recommended. It is also not recommended to treat adult moths because they likely do not spend the majority of their time in tobacco. Instead, management strategies should be targeted to the larval stages. Splitworm mines remain present on plants after the larvae have left the plants to pupate, and before applying any pesticide targeted to the larvae, check to determine if mines are active (contain live larvae) or inactive (are empty, contain dead larvae, or contain parasitoids). There is no benefit to treating inactive mines, as the larvae are no longer present. There are few good options for control. Belt and Coragen, two recently registered insecticides in tobacco, are labeled for tobacco splitworm, but efficacy data is limited. If a splitworm infestation occurs during the harvest period, growers may be able reduce populations by harvesting leaves with active mines and following with insecticide sprays (this is not a recommendation to harvest unripe tobacco). Native ecotoparasitic wasps (species unknown) attack tobacco splitworm larvae in North Carolina. In some fields, wasp larvae are numerous and in others they are rare. In most cases, wasps are not present until infestations are already large and will probably not provide economically acceptable biological control alone.